I have so many thoughts on the first day of first grade. The morning was surprisingly amazing and delightful. The dresses (chosen by very exacting children) DID shrink a bit in the wash & looked fine. The girls were excited and I got some excellent pictures. We were not late or even flirting with disaster to be on time with the bus. It was gloriously drizzly, cool, and overcast ALL DAY. I got some real quality time in with Little Man. Clearly he's enjoying the attention. The afternoon took a hard left turn with news that my brother had been in a rather serious accident, and without going into much of the details- it's been kind of a cluster cuss. (Fantastic Mr Fox!) I *almost* missed the girls getting off the bus, and had a brother who was very much still in shock in the car. By the day's end my nerves were completely fried. The second day was good. More normal feeling. 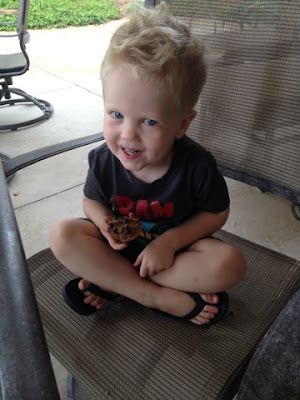 I again spent a good chunk of the morning with a little pal, while he relished having Mommy all to himself. He was SO GOOD. The whole time! And I was pushing the limits of what is usually possible, making just a few too many errand runs than I would even chance with kids in tow. He was perfection. Once the girls got home, I stuck Little Man at the counter with some Play Doh and sat down to do some serious homework with the twins. (the first week's homework is bordering on nothingness, but I'm making them read to me for their allotted 20 mins, which takes so much more time) By the end of the day, had everyone been perfect? No. We'd had some scuffles. Nothing too big. I was left struck with this thought: one kid is gigantically easier than three. Which left me feeling bad. I love those two first graders! I don't NOT want them around! As I thought more about it, I realized, it is more complex than that. I didn't feel guilty putting the boy on the backburner for a while while I concentrated on homework with the girls. He was also not as clingy and worried. Why? Because he'd had TONS of mommy time. He felt "fulfilled!" (As fulfilled as a 3 yr old can be) This freed up my conscious to focus on the other two. It was a balance! And balance feels great. Hope your brother is doing okay! I love that you let it go and let the girls wear the outfits they chose on the first day. I'm working on that a little bit myself. 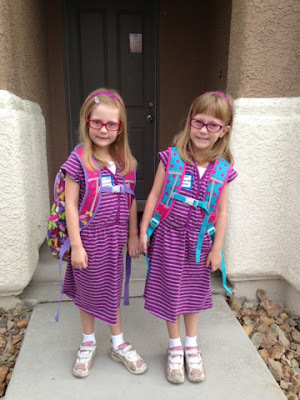 : ) I hope they have a fantastic first grade year!